We enjoy new or unusual experiences experiences and getting off the usual tourist path sometimes, but we also try to visit the most popular attractions in an area when we visit even if they are touristy. Outdoor stops and active picks are always popular with us but there are also stops when we are looking for comfort and relaxation. We want every day on a trip to count, and to be as full as possible. Our children at the time of this itinerary: 3 children-Boy age 17 years, Boy age 12 years, Boy age 10 years. Description: Any visit to San Diego would not be complete without a glimpse of the famous and unusual Coronado Beach, a spot that is ranked as one of the top beaches in the USA. The white sand has silvery accents due to the mica that it contains, and the town has a very interesting history that is rich and fascinating. Swimming and other water activities are available at Coronado Beach, and there are many boutiques, restaurants, galleries, and other places to visit for those who tire of the sun, sand, and sea. Beach volleyball is typically offered on the beach, and the tide pools are very popular. Smoking is not allowed on the beach here and will result in a fine. Our Experiences: Our visit to Coronado Beach and the quaint beach town was a nice experience. The sand has a sheen or shimmer that can be seen at times because of the mineral content and the beach is nice. The kids enjoyed being able to run free and the adults were ready to relax a little, but this beach can get crowded sometimes. We could see why this beach is rated as a top San Diego destination for visitors and locals both. This is a great stop for anyone who enjoys the beach and has time to spend here. 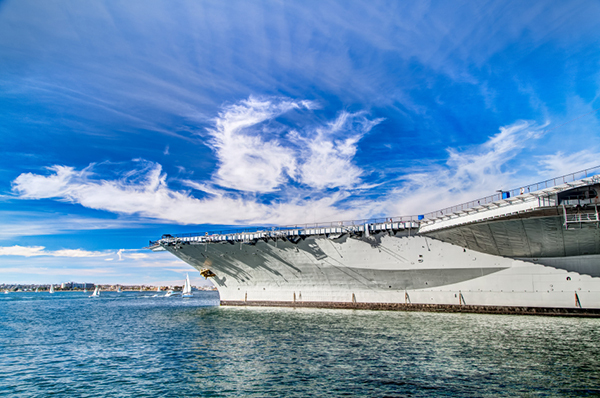 Description: An aircraft carrier museum in the San Diego area offers kids and adults both something to enjoy. These museums are actually military ships that are no longer in service, and they have been well preserved. Visitors can get the chance almost every area and learn about the different functions and various crew activities on board. A large number of exhibits and interactive displays help visitors discover what life was like for the men and women who served. A number of aircraft and other vehicles may also be displayed for visitors to see and experience. Our Experiences: Our visit to Sand Diego included a trip to an aircraft carrier museum, and this was quite educational even for the adults in our family. The kids had a lot of fun exploring the ship and viewing the different airplanes that were on display. The self guided tour has audio which allowed us to take our time and not rush through the different exhibits and areas of the ship. The narration along the tour describes the history of the aircraft carrier and tells about the crew who operated it. This stop received high marks from everyone, and our family liked this stop a lot. Description: A flight simulator can be an exciting adventure for all ages. Experience the thrill of fight, engage in a dogfight, or try out your skills launching from and landing on the flight deck of an aircraft carrier. The flight simulator gives you the experience of an aircraft pilot without any of the dangers that flying can have. Visitors can fly missions and see what combat pilots and others who fly military aircraft go through in the air. Most simulators do have height and weight requirements. Normally kids must be at least three and a half feet tall to ride with an adult, and four feet tall to ride alone. Our Experiences: We had a great time on the flight simulator during our visit to San Diego, and the kids were really happy with this stop. We choose a mock dogfight for our experience, and the thrill of the battle was incredible. The simulator rolls, does loops, and made us feel like we were really in the air fighting off the enemy. This is a good stop for families who enjoy excitement and new experiences, our kids loved it and it was really fun for the grown ups as well.